Wayne Reittie scored for the fifth consecutive game against his former club Doncaster but was unable to prevent Batley Bulldogs from crashing out of the Challenge Cup. Batley had won their last seven meetings when visiting the Dons but they were left to rue a host of missed opportunities. Batley made a lively start with Daniel Yates launching a dangerous up and under which was gathered by Jason Tali, while a second Yates high kick was safely collected by Kieran Buchanan. Doncaster went close at the other end as Kesik kicked to the in goal area but it was too far for Connor Bower to gather before Batley’s defence twarted a strong run by Sam Doherty. Batley created a glorious chance to take the lead as Louis Jouffret and Dave Scott linked to feed Johnny Campbell but the winger spilled the ball as the first of several scoring opportunities was squandered. Adam Gledhill capitalised on an Elliot Townsend knock on but was held short of the line before Batley created an overlap on the left but Alex Bretherton was unable to gather the final pass with the line at his mercy. Batley continued to pile on the pressure as Jouffret kicked towards the line on the last tackle but Doherty was alert to clear the danger. Batley again moved play wide but Sam Smeaton was unable to find wing man Wayne Reittie with a short pass. The Bulldogs continued to search for an opening which would have helped settle their nerves but another opportunity went begging as Jouffret and Scott linked to feed Lewis Galbraith but the Doncaster cover defence got across to take him into touch. Having weathered the Bulldogs pressure, Doncaster took the lead three minutes before half-time as Jordie Hedges produced a neat kick and Connor Bower leapt above a defender to grab the ball and touch down, with Hedges converting. Batley began the second half well and scored twice in the space of five minutes to seemingly turn the game. Reittie was tackled close to the line having counter attacked from a Menzie Yere kick but Batley maintained the pressure and moved play inside for Michael Ward to score between the posts and Scott converted. Scott and Campbell linked soon after for Reittie to power his way to the line and resister a try against his former club for the fifth successive time. Scott converted and Batley led 12-6. However, things started to go wrong for the Bulldogs when Joe Taira was sin-binned for a high tackle on Kesik and the home side took immediate advantage as Hedges sent Yere storming over for a try on his Dons debut. Batley were still down to 12 men when Jason Tali made a quick dart and sent Doherty squeezing in at the corner, with Hedges landing a towering touchline goal. 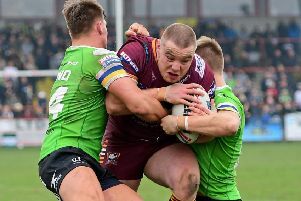 Batley had a final chance to try and force extra time but Paul Brierley was unable to hold the ball close to the try line and yet another chance went begging as the Bulldogs were on the wrong end of a giantkilling.